For the seventh consecutive year, Saint-Gobain has been named as part of the Top 100 Global Innovator by Clarivate Analytics, which determined the global ranking of the most innovative companies and institutions. This is recognition, among others, of the significant Research and Development effort made by Saint-Gobain. Our R&D is supported by 3,700 employees, a global network of eight cross-business research centers and numerous dedicated R&D units for a total investment of €450 million in 2017. 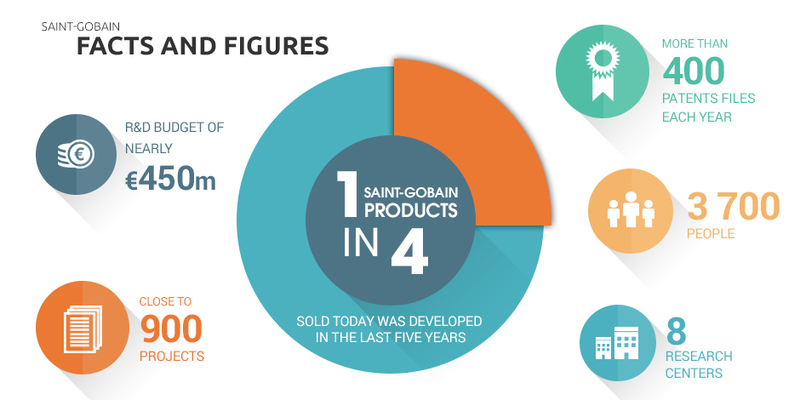 With more than 900 R&D projects in progress, Saint-Gobain has a pool of innovations that allows it to launch many new products every year. One out of four products sold today by the Group did not exist five years ago. As part of a rigorous improvement approach, Saint-Gobain has set the goal of conducting life cycle assessments for all its building industry product ranges using LCA (Life Cycle Analysis) methodology. A product or solution is eco-innovative if it helps reduce the use of resources (notably energy and water) in buildings and infrastructure and/or if it has a smaller environmental impact across its life cycle. Saint-Gobain has been deploying specific training programs in the Activities and country organizations since mid-2012 to inform all managers and their teams about the integration of eco-innovation in existing innovation processes. The objective is to spread this culture of eco-innovation more systematically throughout its organization by creating awareness and providing in-depth training for researchers, as well as for marketing, purchasing, health-environment-safety and production teams.